The flag was adopted on October 5th, 1995. Description: Red field with a golden sun in the middle, with eight rays thickening towards the end. "Macedonian State Flag since 1995"
Article 1: This Act establishes the flag of the Republic of Macedonia. 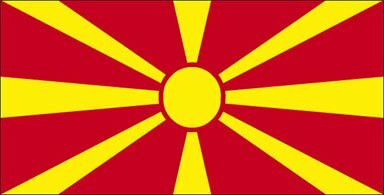 Article 2: The flag of the Republic of Macedonia is red with a golden-yellow sun. The sun has eight rays, emerging from the sun-disk, thickening towards the end. The sun rays are crossing diagonally, horizontally and vertically. The diameter of the sun-disk is equal to one-eighth of the length of the flag. The centre of the sun coincides with the intersection of the diagonals of the flag. The ratio between the width and the length of the flag is one to two. Article 3: Design illustration of the flag of the Republic of Macedonia is a constitutent part of this Act. Article 4: On the day this Act comes into effect the Act on the Flag of the Republic of Macedonia (Official Gazette of the Republic of Macedonia No 50/92) ceases to exist. Article 5: This Act comes into effect on the day of its publication in the Official Gazette of the Republic of Macedonia. ново сонце на слободата ! нови песни, нови весници ! novo sonce na slobodata ! new sun of the liberty ! for their own rights ! After independance in 1992 Macedonia retained the coat of arms adopted in 1946 (by the Act on the Coat of Arms of the People's Republic of Macedonia, adopted by the People's Assembly of the People's Republic of Macedonia on its second extraordinary session held on July 27th, 1946, later on altered by article 8 of the Constitution of the Socialist Republic of Macedonia). as the emblem of the People's Republic of Macedonia within Yugoslavia. A new law is to be proclaimed. 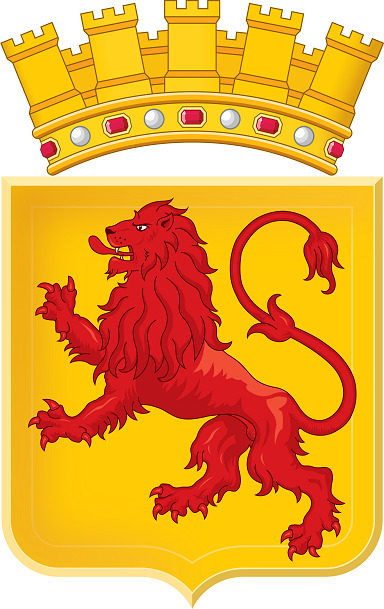 The coat of arms is described this way: The coat-of-arms is composed by a double bent garland of ears of wheat, tobacco and poppy, tied by a ribbon with the pattern of a traditional costume. In the centre of such a circular room there are mountains, rivers, lakes and the sun; where the ears join there is a red five-pointed star. All this represents "the wealthy of our country, the struggle and the freedom". In forefront of the coat of arms is the Šar mountain, and the waters of Ohrid lake. The Coat is bounded with wheat and poppy plant laterally, and on the basis with a Macedonian national motif, often found on the Macedonian national outfits (dresses).